Beautiful and secluded wooded property that is only minutes from the Village of Afton and I 88. Bring your plans and builder - this parcel would make a nice seasonal or year round home site with plenty of hunting and off road recreational opportunities. Afton Elementary School Pre-School, Elementary School / Public 4 2.81 mi. Afton Junior Senior High School Middle School, High School / Public 3 2.81 mi. W A Olmsted Elementary School * Pre-School, Elementary School / Public 2 5.23 mi. Greenlawn Elementary School * Elementary School / Public 4 7.81 mi. Bainbridge Guilford High School * Middle School, High School / Public 7 7.38 mi. Harpursville Junior Senior High School * Middle School, High School / Public 4 5.23 mi. 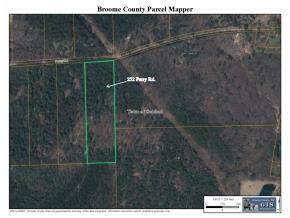 252 Perry Road, Nineveh, NY 13813 lots and land was sold for $16,000.